I am very happy to announce the publication of Winning the War on Cancer book, which ended up being 850 pages (93 chapters). During these weeks of waiting for my computer people to get up to speed I have added more than several chapters so am not sorry for the delay. I believe this work will bring a light into the darkness that dominates the cancer world with its potential to save many lives. It is especially important to those who have limited financial resources for many of the most important protocol items are inexpensive. As usual I have to thank the many brilliant doctors and scientists I have relied on who have helped me put together this comprehensive textbook that strikes a hard blow against the medical industrial complex. Medical freedom is crucial for cancer patients. It is my honest opinion that modern oncology is analogous to concentration camps without barb wire or guard towers. You walk in and you put your life in the hands of the same type of doctors who worked for I. G. Farben. The vast majority of orthodox oncologists are card carrying members of the pharmaceutical club trained to do their bidding. 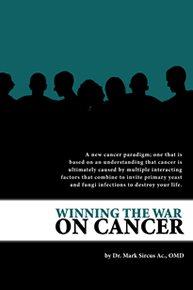 Winning the War on Cancer is a must read for cancer patients and doctors alike. It takes us beyond individual theories on various cancer cures - introducing an entirely new paradigm in cancer care and prevention. Rarely will you find a book on cancer that offers so much. Modern orthodox oncology ONLY uses treatments and tests that cause cancer to diagnosis and treat cancer but all of the substances used in this work are natural, safe and effective. Our methods combine the best of the world of allopathic science and alternative methods joining the two in an easily understood format. This text is deep enough for doctors and other health care professionals while at the same time completely understandable for the patient whose need for essential information is absolute. Most of my protocol can be self administered, are much more affordable and more protective of our immune systems than any currently promoted pharmaceutical chemo or radiation therapies. One of the books basic philosophies is that there is no single cure for cancer. There are literally hundreds of cures and combining the best of them into a winning protocol is what this book is all about. This work presents the work of many brilliant medical minds with special attention paid to the mind/body/spirit connection, nutrition and toxic exposures. No one should agree to any cancer treatment without first reading the comprehensive information in this book. For a limited time, purchasing this html formatted e-book will come with a free personal consultation by phone with me. Cost of the book is $79. The book is beautiful and all links are active so one can quickly navigate around the references and back to many different sources on the Internet. I have a special request to all IMVA readers who have sites of their own to please link to www.winningcancer.com I am available to talk on the radio and anybody who requests a chapter or two of their choice to put on their sites will be accommodated. LEGAL NOTICE: The Author specifically invokes the First Amendment rights of freedom of speech and of the press without prejudice. The information written in this email is for informational purposes only under the rights guaranteed by the First Amendment of the Constitution for the United States of America, and should not in any way be used as a substitute for the advice of a physician or other licensed health care practitioner. The statements contained herein have not been evaluated by the FDA. The products discussed herein are not intended to diagnose, cure, prevent or treat any disease. Images, text and logic are copyright protected. A unique feature of Shower Filter is the "Dial-A-Date" reminder ring. It's as easy as screwing on a lightbulb! Made of high quality bamboo and 100% Pure Boar Bristle, Superior Quality Body Brush with easeful handle. For improvement of your blood circulation and smoothy of your skin, make them jealous - Exfoliating dry brushing body brush. Feel Relaxed - Best body bath brush scrubber will reach areas where the others are not reachable. See our page on Cosmetics.